"IN DEFENSE OF RURAL AMERICA"
The "In Defense of Rural America" column archives are available HERE. "When Older Americans Die Who Will Speak For Freedom?" and nationally recognized author on freedom and property rights issues. We are helping to spread freedom and liberty around the globe. After writing a weekly conservative column for 12 years, one thing has become crystal clear. Only older Americans are reading and responding to what we write. When we say older Americans, we mean those over 70 years of age, with many of our responses coming from individuals well over 80. The results of the 2016 presidential election tell the story from the exit polls. 18 to 29 year-olds went 55% for Clinton. 30 to 44 year-olds went 50% for Clinton. 45 to 65 year-olds went 53% for Trump and 65 year-olds and older also went 53% for Trump. The male-female vote was essentially split. 54% of females voted for Clinton and 53% of males voted for Trump. But in the 2016 Primaries, what is even more telling, millennials (18 to 29) voted for Bernie Sanders 25% greater than Trump and Clinton combined. Bernie Sanders is so far left of the center of the Democrat Party that he is in fact a pure socialist. So why are millennials going for socialism? One only needs to look at our public schools and liberal colleges to figure that one out. At least three generations of teachers, parents and young adults have been indoctrinated in collectivism, multi-culturalism, political correctness, socialism, radical environmentalism and the one-world-order mantra. Academia has gone so far left that it does everything in its power to silence any other point of view, including using violence, harassment and intimidation. Check out the riots on college campuses these days against conservative ideas. Like all large countries, America has been moving virtually unstoppable towards socialism. With few exceptions, every single nation on the planet is run by a socialist or communist government, or brutally governed by a dictator. America was the last bastion of freedom ..... until now. The United Nations is, without a doubt, a socialist organization. All of its policies are based on a socialist platform. When will America be added to the list of socialist countries, or are we already a member of the socialist club of nations? We are so close that it is only a matter of inches, not miles. With this massive planet-wide rush to socialism, who will speak for freedom in America? Right now, only those who know what freedom was, speak for freedom. With three generations of socialist brainwashing, the only generation left that may remember what freedom was, is the generation closest to the end of their lives. Sadly, their energy, drive and ambitions are significantly diminished and they don't have the stamina or the will to fight anymore. But they do have a broad point of reference that gives them a better view than those that are younger. When they die off, who then will speak for freedom? Sure, there are several million younger folk between 45 and 70 that have their guns oiled and their survival gear at the ready. But when push comes to shove, will they put their lives on the line when there is no other choice but violence to restore freedom? They will be a small minority in a nation of tens of millions of big-city socialists. So what is the older generation saying about freedom? The following responses to our articles represent some of what conservative Americans think and feel about the future of freedom. To our point, most of these responders are in their late 70's or 80's. "Arguably, and sadly, one of your best columns. A liberal friend and I decades ago were discussing the future of the country and how long it could last. He said he didn't know how long, but that it wouldn't be war that took us down, it would be the bureaucracy, which answers to no one and grows exponentially with time. So true. I'm damned near 80 and hear more and more people of my vintage say they are, one, glad they're old and, two, they have little hope for their children and grandchildren. Most of them don't have a clue as to what is really going on, but they sense and know things are in really bad shape. What's to say? We're toast and you've got to be damned near eighty to see it?" "As usual a great article to the heart of the matter. Everything you say is unfortunately true. The divide and conquer approach has been promoted for years in this country unobstructed by the general public. Alinsky and Marx are well and just chugging down the road. This scenario is a no win game because the answer to the problem is the problem itselfâ€”the people, which make up the individual groups. They will not change and you and I both know that to be the problem. I have not seen, heard, nor do I know of anyone who has put forth a realistic detailed plan to deal with this issue." "Again you have written a clear and concise view of where we are as a country. As you stated, because of the enormity of the beast, along with conflicting and over burdensome laws, this beast will collapse and there will be a revolution. My view is that the people have gone from self-reliance, discipline, thrift, hard work and a strong moral base to an entitlement mentality, moral debauchery and greed. I know I am not telling you anything new. So many people were fooled into thinking there was a "free lunch" and they took the easy way out. I am remembering a Russian friend. She helped the current Russian immigrants in her community -- this was around the early 1990's. She told me that she always got flyers from the government telling her about all the free services that she could sign up for. She thought that was wonderful that our country was so rich that they could reach out and be so helpful. I told her that our country was bankrupt and the people were maxed out on their credit cards. She just couldn't believe it." "Hi. I just want to let you know that while I do not generally respond to your articles, I read each and every one of them in full and I save them all for future reference. Even if people are not responding to your articles, please don't ever assume that you're yelling into a void. A lot of us don't really know what we can do about the state of things in our country, but your articles are giving us information and hope because you show us that there are other people out there who care about the same issues that we care about. Thank you for what you do." "As usual Ron, a great, to the point factual article. Everything you have said is patently obvious to everyone but the general public with a progressive liberal mindset. Since roughly 50% of our population has a liberal mindset, the chances of Americas survival are slim at best. Even in the face of irrefutable evidence to the contrary, liberals continue to cling to their destructive belief system. I am afraid that only a cataclysmic event effecting there belief system would alter there thinkingâ€”and maybe not." "Not to be beaten down by ignorant responders, Ron, any dissenter from what has been soundly established as the "new normal" in that paradigm reflects the extent of success deep state control has accomplished over closed minded followers of the agenda to weaken America's Constitutional system. We are well into the third, and possibly fourth generation of public school graduates who have no depth of history, consider America a tyrannical nation (since founding) and believe all our problems are the fault of capitalism. These followers of Socialism mirror the outcome of their K12 and college training. Our social, cultural and moral systems have all decayed to shocking levels." In contrast, here is a response from a big-city Democrat (New York) who takes issue with our conservative viewpoint from time to time. This response is representative of what well over 50% of Americans believe. This is the mindset we are up against. It didn't happen by accident ladies and gentlemen and has been pre-planned by Progressives for over 100 years. "Hey Ron, you really need to see psychiatrist. You have been so thoroughly brainwashed by right-wing propaganda you are now crazy! I pity you. You are totally paranoid. "My kind" have "destroyed America? That's rich! If anyone has destroyed America it's the most dangerous terrorist organization in America - the Republican party, which has ruined the US economy with its disastrous "trickle down economics" imposed on us by the 3rd worst US president Reagan, after Trump the worst and GW Bush the second worse. They have destroyed the middle class in America allowed the cost of living to increase steadily while keeping wages from rising, destroyed millions of jobs by outsourcing and created ever increasing unemployment, poverty and hopelessness in this country. Yet clueless morons like you blame the Democrats for all our problems. And the Constitution is whatever right-wingers like you say it is, not what it really is. You use it as an excuse to justify your stupid and destructive right-wing agenda for America. If you disapprove of something, it's automatically "unconstitutional". "Unalienable rights?" What the heck are those? Whatever YOU say they are. Please calm down and see a psychiatrist! You need help." We'll close this article with a response from a younger American who has a perspective that is shared by way too few of his peers. "I am 50. Although this country has made some pretty bad and even shameful decisions throughout history, it has brought forth generations of good loving people who have forged great communities across this land. Our land even through wars and conflicts always had an innocence that you could feel inside and from the friends and family around you. All the shows I watched as a young boy on TV were wonderful because they truly portrayed the reality and quality life that we had back then. Were we perfect? No. But we had a true and humbling sense of pride of who we were and of those who mapped out the way to freedom and independence. Now it is a daily nightmare where freedom has been replaced by greed and corruption. Independence is now dependence. More and more I feel like an outsider in my own country. Worst of all is that I feel isolated and fear that America is going to be lost forever if we don't do something about it now. Where is John Wayne and Davie Crockett when we need them?" Many older Americans feel exactly the same way this younger man has described. Ron Ewart, a nationally known author and speaker on freedom and property issues and author of his weekly column, "In Defense of Rural America", is the President of the National Association of Rural Landowners, (NARLO) a non-profit corporation headquartered in Washington State and dedicated to restoring, maintaining and defending property rights for urban and rural landowners. He can be reached by e-mail for comment at info@narlo.org or by 'phone at 1 800 682-7848. COMMENTS: Should you desire, you can e-mail a comment to this article at: comment@narlo.org. Worthy, thoughtful comments, in our sole discretion, will be posted below the article. Comments that use foul language, pejoratives, or attacks against others will be discarded. Be sure to include your full name, as blind e-mail comments will not be posted. 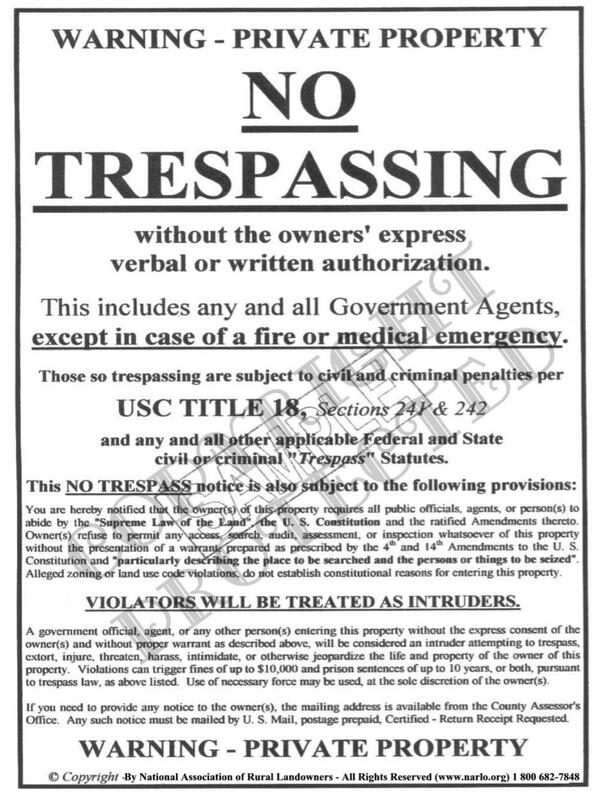 Thousands of these huge 18" x 24" aluminum signs have been installed on urban and rural land all over America and they have proven to be a significant deterrent against trespass by government agents and other would-be intruders. Determine for yourself by clicking on the image below. Are you being beat up by government from land use code violations, draconian new environmental laws or being threatened with eminent domain, we can help. Check out the "NARLO Offense" by clicking on the image. © Copyright January 2017 by the National Association of Rural Landowners - All rights reserved.